b. November 10, 1844, Union (Towns) County, Georgia; d. March 15, 1927, Buried at Upper Hightower Baptist Church Cemetery, Towns Co. GA.
1) Malinda Jane Haseltine Osborn; Date of marriage -29 Nov 1866-Towns Co, GA. She was born on 10 Jul 1847 and died on 5 Sep 1872. 2) Margaret A. "Maggie" Glazner - marriage took place on 13 Mar 1873 in Towns County. 4) Lucy A. Nicholson was born on 20 Sep 1863 in Fannin County, Georgia and died on 25 Jul 1955 in Baldwin County, Georgia. She is buried in Westview Cemetery, Atlanta, Fulton County, Georgia. 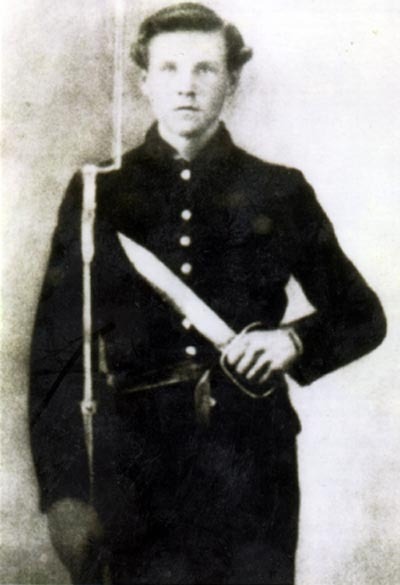 He enlisted as a private in D Company, 24th Regiment Georgia Infantry on Aug 24,1861. He was appointed 2nd Sergeant in 1863. During fierce fighting at Cold Harbor, VA Jack was caputured by the Yankees on June 1, 1864. He was put into a Union prison and was not released until July 7, 1865 in Elmira New York, 3 months after Lee surrendered.